You've got options when it comes to powering your IoT devices. Whether you go with hardwiring, batteries, or something else, here are the tradeoffs. Our previous blog focused on the brains of IoT devices, where we learned about the importance and function of a microcontroller. This week, we’re taking a look at the power systems behind IoT devices. The size of an IoT device can range from tiny to very large. It might perform a single, simple function, or have complex on-board intelligence. It may transfer byte-sized data over short range radio-frequency identification (RFID). Or, it may transfer high bandwidth streams of data over long distance cellular. The IoT de- vice may be in a fixed or varying location, and it may or may not be easy to access. Despite the many differences, there is one common requirement for all device systems. They must have power (energy or electricity) to operate. For many applications, you may only need to plug in the connected device. Home automation applications, such as connected light bulbs, can draw energy from existing wiring in the home. Industrial applications are often fixed-location devices, hardwired to a power grid. 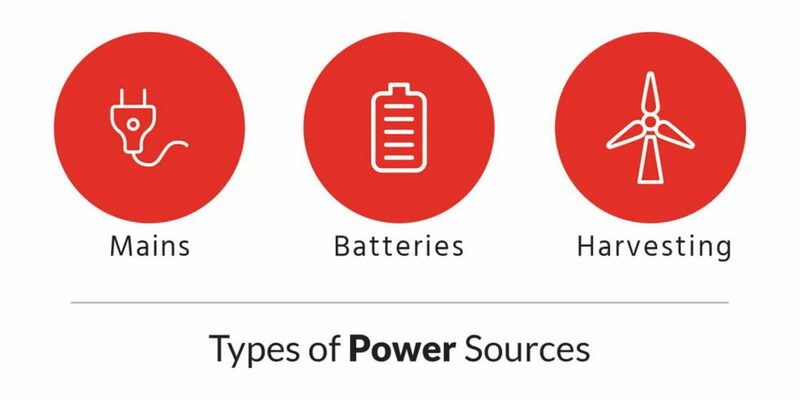 Found in everything from wearables to tools, batteries are a common solution for portable IoT devices. Your application will determine if it makes sense to use rechargeable or one-time use (primary) batteries. Several approaches for converting energy from ambient forms into electricity are becoming popular. Solar cells, converting light to electricity, are most common. It is also possible to convert air and fluid flow, heat, motion, RF and chemical energy to electricity. Note that across the entire IoT system, there may be more than one power solution. For example, wearable health monitors for factory workers may be battery powered, while mains power the central monitoring system. A key design strategy for energy consumption is the “duty cycle”. This is a technical term for how long devices are on and functioning, versus “sleeping” to conserve energy. The 2016 Olympic Games taught us that nobody takes more than four steps per second. Usain Bolt’s 100m gold medal was 41 steps in 9.81s. This indicates the accelerometer in an activity tracker (which can turn on and off quickly) doesn’t need to take 1000 measurements per second to capture every step. Instead, 50 or fewer measurements per second are enough to capture a step at any point it might happen. The rest of the time the accelerometer can be in an off state (sleeping) to save power. When working with your design team, ask them to develop a power budget. This is a table that shows the relative energy cost of each operation in the system. Everything from the microcontroller to sensors to wireless radios use energy. Each of these can also be designed to operate with a power optimized duty cycle to conserve energy. Most often, radio transmission is the most expensive line item in the energy budget. Depending on the energy cost of transmission, it may make sense to add memory to your design. Doing so, you can capture and store sensor data locally to transmit in batches. Memory storage and retrieval functions are usually much lower power operations. Transmitting in batches, as opposed to real-time, allows the radio to be off most of the time, thus conserving energy. At a fundamental level, it is important to consider what features are necessary for your product. Some of the first activity trackers did not deploy full color screens, simply because they drained the battery. Putting each feature as a line item in your power budget allows you to cut out non-critical features until the product’s energy life is sufficient. Another cost to using batteries is size. Often, the battery is the largest, heaviest component in the device. It would not be worthwhile to make a Fitbit larger to ex- tend battery life. This would negatively influence wearability, a significant product feature. If you want or need to use mains electricity that is not readily available, you will need to find another energy source. This was the case for the creators of the world’s largest wearable: The elephant collar. The Army Research Office and students at NC State University created this product for the safety of both elephants and humans. Tracking the animal helps to keep them away from human settlements where they could face inevitable death. In this situation, replacing the battery was not an option because it conflicted with the goal to avoid human interaction with the animal. Mains electricity was not an option, considering there is no power grid in the Savannah. Therefore, solar energy harvesting was the best option to keep the collar charged. This technique keeps the device running, while also keeping the elephants away from areas occupied by humans. In the medical space, wearables are forging an early path to implantable devices. Today, most pacemaker batteries require periodic surgery to be replaced. New options are being explored to make these devices sustainable for life without follow-up surgery. To keep the pacemaker charged, this approach would use piezoelectric materials that harvest energy from the motion of each heart contraction, as well as RF energy harvesting. To summarize, developing a strategy for extending device battery life requires the following three steps. First, narrow down your list of features to only practical, must-haves. Second, closely assess your power budget. Third, weigh your must- have needs against your power budget. These steps will get you well on your way to fully energized, connected devices.